Malwarebytes 3 may block legitimate processes or functions, such as saving files, on Windows PCs. When I started a PC running Windows 10 Pro today for instance, I got some strange error messages thrown by various programs. The screen capture tool SnagIt complained that it could not save the captured file (failed to save document), and the image optimizer File Optimizer would not process images at all, and would show a saving of 0% for all files that it processed (which never happened before). This was indeed a strange issue, as both programs worked fine yesterday. I did not make any serious changes to the system as well, no Windows updates for instance. Security software may interfere with processes and programs, especially if it was updated. I checked the Malwarebytes installation on the system, and noticed that the "update package version" was set to 1.0.1802. While I'm not entirely sure when the update landed, it must have happened in April. I made the decision to test the theory, and add the SnagIt folder to the exclusions list. When I tried to capture a screenshot afterwards, it worked as expected and did not threw an error message. Open the software program with a double-click on the system tray icon. Select Settings > Exclusions when the program opens. 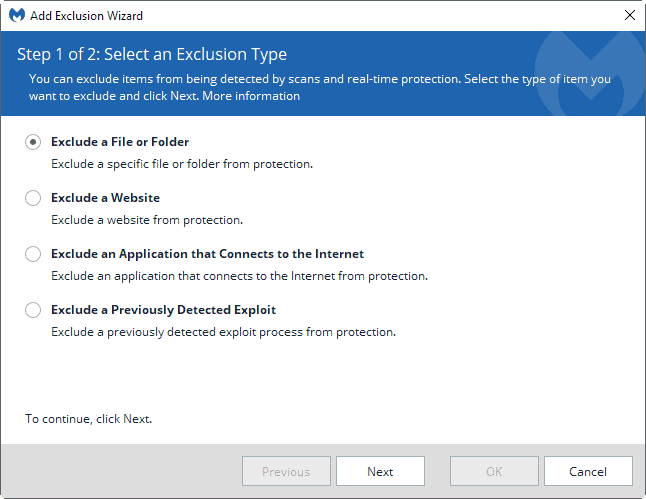 You will notice that the program ships with exclusions by default to protect core Windows locations from being flagged. Click on the Add Exclusion button in the interface to get started. The screen that opens gives you four options to add a new exclusion to the software. Select Exclude a File or Folder from the selection menu, and click on the next button once you have done so. You need to know the file or folder path. You use the select files or select folders button to use a file browser to pick the right files or folder. It is better usually to whitelist only specific files, and not a full folder. This may not work all the time however, for instance when Malwarebytes flags not the executable file, but another file that is required. 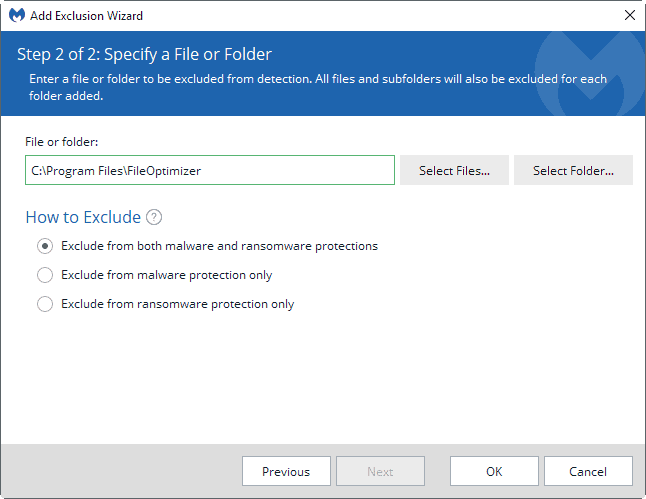 You may exclude the selection from malware and ransomware protections, or from one of the two protections only. When you are done, click on the ok button to add the selected file, files or folder to the list of exclusions. You may want to test the program and its functionality at this point to make sure that the issue is resolved. Repeat the whitelisting for any programs or files that get blocked by Malwarebytes. Note that you may apply this to other security programs as well, as Malwarebytes is not the only program to flag legitimate processes. Anyway, I would like to hear if you have run into similar issues with the new Malwarebytes 3.x, or the security programs that you are using. 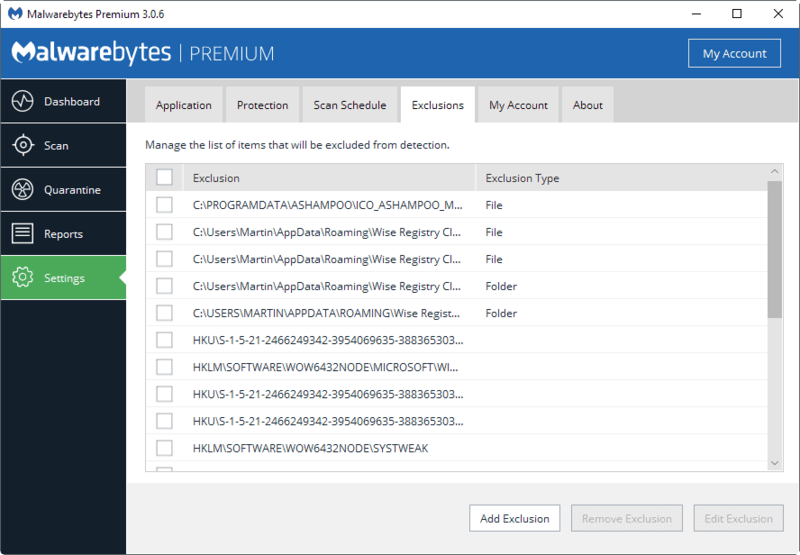 If the Malwarebytes security software blocks legitimate processes or files on Windows PCs, adding those to the exclusions list may resolve the issue. Or . . . do as I did and uninstall Malwarebytes 3 entirely; I have Bitdefender Pro anyway so M’bytes is spurious. I wouldn’t trust Bitdefender with a 10 foot pole, there share your collected data with other company’s, huge violation of privacy. I had repeated issues with 360total security’s update.exe so excluded that file. My “update package version” is set to 1.0.1804, and I hadn’t (yet) had this kind of issue. With Kaspersky Internet Security, yes, I had this kind of issue, but not often. Some softwares were no longer considered healthy and I had to add them to exclusions overnight. Or just uninstall Malwarebytes and wait for them to get their act together. I still use their 2.2.1.1043 version for the occasional scan, not running it constantly in the background. I have heard nothing but bad things about later versions and here’s another occasion.. On my Windows 10 laptop, which is from 2009 and not a speed-beast in any shape or form, I found that Windows Defender was bogging down the system. Constantly doing something and kept on failing to update its definitions, which is ricockolous. So I switched to BitDefender FREE AV and also use their anti-ransomware. Two nice small red “B” icons sitting in my notification area and keeping me safe and my old crappylappy very happy indeed. I also disabled Defender and the Defender security center thingy with a couple of registry tricks and now all is well. I think I can live without Malwarebytes monitoring and blocking every program. Besides, Redmond SAID Windows 10 is the safest thing ever! What could possiiiblyyyyy goo wrooong haha… Fingers crossed. Don’t kid yourself w/ “two, nice small red ‘B’ icons in my notification area keeping me safe.” False sense of security. Anyway, Martin provides a great instructional template for addressing issues that may arise with any tool used for blocking processes or locations in order to prevent some type of infection. One can learn and transfer the skill used for MB exclusions to nearly any product that may interfere with the normal functioning of Windows. Its inserting to see that MWB’s is giving common users issues. Since I have a ton of “hack&crack” stuff to run trainers or without a disc I already block every other thing from the internet, false positives is the norm for me so i am use to excluding stuff. MWB3 has been interesting, kaspersky always tells me when it whacks something MWB not so much, I wish there was notifcation on every exploit prevented and then an easy way to white list it without having to go though a ton of clicks to get to MWB’s exclude page. I had the same problem with MWB flagging Avast “Behavioral Shield”. Contacted Avast and they told me to use their program without that shield or uninstall either Avast or MWB. So, do I go to MWB and tell it to exclude Avast? Thanks for the heads-up because I was wondering why MWB was going nuts! That’ s easy to get around, First go to guarantee section to see if MWB is blocking any of your regular programs like Avast, click all check boxes to restore, then right click on MWB on taskbar to exit, download latest version to install, afterwards, Open up turning MWB back on by just double clicking the desktop icon, Then run a full scan, afterwards when it finds the programs it detects as threats uncheck everything and click next then choose always ignore which creates a rule for that program which makes it safe on your system and ignored by MWB. So in the future if you open or do updates for Avast you not get blocked popup from MWB. Method works for just about any other program that gives you problem with MWB, one program I use that seems to do this until you do this is auslogics registry cleaner, after doing this never get a blocked popup again. I too use MWB 2.2.1.1043 & also once in a while, not background. Malewarebytes is just too cozy with google, literally next door. Everything on your computer is uploaded to them (Malewarebytes). You can disable that in the settings section so it doesn’t collect data and upload to them. The great part is when you click on the ‘always ignore’ button and all it does is always ignore you and keep flagging said process or file as malware.